How to clean Stainless Steel…for real! I just discovered this today and I couldn’t wait to share it! Here at The Smithocracy we believe in sharing with others. Something that my 5-year-old is trying really hard to comprehend. Today as I was cleaning, I discovered the most amazing way to clean my stainless steel appliances. This may not be a secret to some of you, but it is new to me. And it works! I love the look of stainless steel. And I believe so do most people. Although since owning it, I have often wondered where the “stainless” comes from. As far as I could tell, you could never quite get it all the way clean. There always seems to be that one finger print that just won’t go away. Or in my case, a slight sheen from where the sticker was. So I was a little bothered by this. In fact I was planning on putting forth a motion to have an official name change. Perhaps Stainable Steel. Or Slightly Smudgy Steel. Anything but Stainless Steel. Until today! From now on it will remain Stainless Steel in The Smithocracy. This was achieved by only changing one thing in my cleaning routine. I use Pledge (thanks to a recommendation from a friend) to clean my Stainless. I find that it works much better then any Stainless Steel cleaner I have tried. I also like it because I don’t have to worry about overspray ruining my cabinets. Pledge is made for wood as well. So I just polish the cabinet up too. I prefer the Dust & Allergen Pledge, but Orange is nice as well. I also use a microfiber cloth. The one above was purchased at Target. I had just finished cleaning my fridge and it looked pretty good. But there was still some smudges, that have been their since we bought the fridge last summer. It is hard to show in pictures, since it is so reflective, but I did my best. The discoloration that is in the circle is left from the sticker. There was also a bunch of discoloration alongside the water dispenser. It is not in the picture because I had already used it to test my idea at this point. And since you don’t see it, it obviously worked! “Tannie, your killing me, just tell us already!!!!! Okay, okay. Here is it. That’s it. Before I would spray and then instantly wipe. That took up most of the marks, but left behind some that seemed to be impossible to remove. The stainless cleaners were even worse, always leaving streaks and barely cleaning it. But today, I had accidentally oversprayed on my stove top while polishing the hood. I decided to ignore it until I was done with the hood. When I got to the overspray on the stovetop I noticed that a cooking stain disappeared with it. One I had resigned myself to living with forever. I tried it again, and another one was gone. I went to the fridge. Sprayed the side next to the water dispenser that was REALLY bad. Waited a minute and viola, Gone! You can see that the sticker stain is gone in my after. Anyway I am so happy to learn that all I needed was a little extra patience. So now every stainless steel item in my kitchen is officially stainless once more. Do you have any cool tricks you’ve discovered. Feel free to share! ***UPDATE*** So I still stand by the pledge method, however in order to stay on the up and up with all you Readers, I need to update what I am doing. 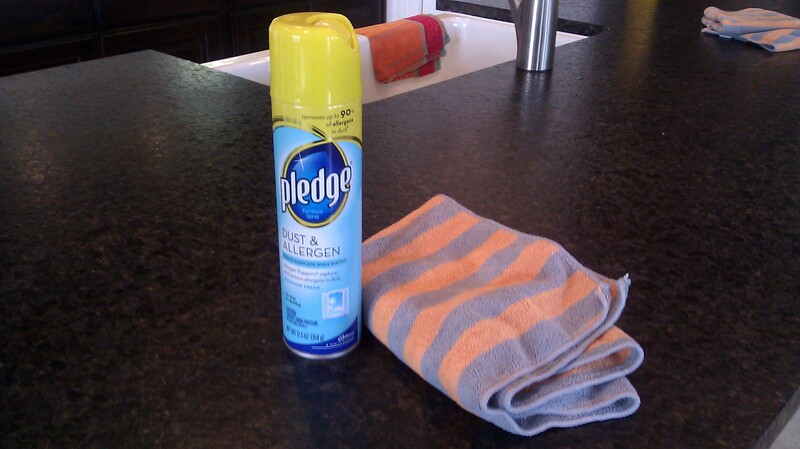 I love the Pledge way, however I do not love the waxy buildup that occurs on my tile floor from the spray falling. For a while I placed a towel down. And that worked ok, but my laziness kicked in. For the last few weeks I have switched too Weiman Stainless Steel cleaner. It works really well so far. So I kind of go back and forth. With the Wieman I have to watch for overspray on the cabintes, Pledge I do not. So anyway, now you know all and my guilt is now relieved! Also there are a ton of other good hints down in the comments section. So try them out and let me know which method you prefer! I am so glad that I am not the only one on a mission to make Stainless Steel stainless once more! Want more cleaning tips? Check them out here. This entry was posted in How To, kitchen, Tips and tagged Clean, fridge, house cleaning tips, Microfiber, Pledge, polish, polishing, refrigerator, Stainless Steel, tips by The Smithocracy. Bookmark the permalink. Funny post and very helpful. although I have tried various things and even oil, which does work, but when I get my wet hands on it the frig becomes a mess. So I will buy some pledge tomorrow and give it a good clean. Since getting the oh so fashionable ‘stainable’ appliances, I now have another chore that must be done before we have company over… polish appliances! or our house just looks messy! Thanks Teresa! Good point on the oil! Thanks for the heads up. Stay tuned for an update on this post. I have since switched what I do. While the pledge does work, I did not like the buildup it left on the tile. So I now have a new method. Look for that post next week. Just wanted to share with everyone… I am new to this site so not sure how I am suppose to so I am just posting here. I really like using liquid gold on all my stainless. You can spray it on an old tshirt so you don’t have to worry about lint. No wax build up, good for wood, and a little goes a long way. Hope this helps. Thank you for sharing Vicki! They also make Weiman wipes, which are AWESOME!! No over spar and not messy at all! I love them!! I have the same fridge. Watch out for the ice maker, it flooded my home last summer. I use baby oil believe it or not and it works wonders. Especially on the stove and microwave for less elbow power cutting through grease. I haven’t had that problem, but our ice maker did freeze over and stop working. It’s a bummer because I love LG products and I love the fridge. However I feel like I can’t ever recommend it because of that problem. Thanks for the baby oil tip! I’ve been told dryer sheets work wonders. Get a Norwex cloth and you don’t need any polishes or chemicals, just water. Yeah that! The Norwex Polishing cloth is amazing. It takes all of those greasy fingerprints right off and can be used with brushed stainless as well. The best part, only water is needed!! No dangerous chemicals, no worring about overspray, and no residue buildup (which just attracts the dirt and grime back faster.) They have a 2 year warranty and only cost $18! Where do you find the norwex cloth? as a professional housecleaner for many years the stainless steel appliances have been a real nightmare for me also. I have also tried pledge furniture wax and on some stainless steel it has worked. When all else has failed try just dishwashing detergent and water, also vinegar and water but dry throughly with a clean soft towel. I also have been a housekeeper for years and my experience is with vinegar and water. 1 part vinegar 3 parts water. Spray on cleaning cloth wipe on, buff with edge of same cloth. I clean for the very high end clientiel and they are always amazed at the results I achieve with this method. Also use on Granite and the like. Cuts all grease and leaves them shining like new. WD40- It helps in repelling water too- Most of my clients stainless steel needs cleaned in our bi-weekly visits- But it’s drastically reduced the amount of cleaning needed- It won’t leave a buildup- With any oil substance you’ll want to spray it directly on the microfiber cloth so it doesn’t create a slick surface on the floor. I, also use WD40..just not fond of the smell…but very cost effective. does a great job. Do you happen to know if the WD-40 works on the brushed stainless steel as well? I had a streak on my stainless steel dishwasher that I simply couldn’t remove, so I phoned the manufacturer’s customer service department. They told me to spray a rag (I used a paper towel) with WD-40 spray, rub over the stain, and then wipe off with a clean cloth. When I said “…and what if that doesn’t work?” the response was “it will.” And they were right. So for the last three years, that’s how I how keep all my stainless appliances streak-free and shiny. I spray it on a paper towel, and then just wipe off. They did say to not directly spray on the stainless steel appliance. I just tried the WD-40 on my stainless steel appliances and it is a miracle worker!! When I was finished, I took the rag, which had a lot of WD-40 on it and polished my quartz counter tops and they look amazing!! You are welcome! However stay tuned for an update. As this method does work, I have since changed what I do. I am planning a new post on it next week! Glad you said so Carrie. I am actually planning an update to this post. I have since switched to Weimer, because I did not like the pledge build up on my tile floors. So stay tuned for an updated post on cleaning stainless. This is all fascinating. I bought pledge today and sprayed directly on the towel. Wiped evenly ( on brushed stainless) buffed with another towel an the shine is amazing. And no overspray on the floor! Hi Dan, we also have brushed stainless appliances. You used pledge with no problem? It was said above not to be used on brushed, are u able to post or send us a pic? The reason this works is because pledge leaves a waxy film. You could also just shine the stainless steel with some regular edible oil. Good idea Eline, I will try it out. The BEST stainless steel cleaner is Howard Naturals! Use a microfiber cloth and you will love the results! I used to buy mine at Whole Foods, haven’t seen it there lately so I ordered it off Amazon. Howard Naturals Stainless Steel Cleaner. You can also go to their website and click on where to buy for your local area. Promise, you will love it! I will keep an eye out at my Whole Foods. Thanks for the tip! I haven’t tried it on the windows. Thanks for the tip! The Pledge for stainless steel is a waste of your money in my opinion. I am a professional cleaner and used it on an elevator wall. AWFUL! You saved my life!!! I have fussed and complained about my stainless frig from the first fingerprint. I loved the look but HATED cleaning it. Your little trick saved the day!! Thanks so much for sharing! I can’t believe how great it looks now!!! Or….we could just get rid of our husbands and kids and they would be forever clean. Haha. Jk. Thanks for this info. Local TV show features 2 ladies from a cleaning service. They were touting all the uses for cleaning with vinegar. They said to mix equal parts water and vinegar and spray on your stainless. Wipe and clean with cloth. The vinegar cuts through grease and wax buildup. If heavy buildup, may have to repeat. Safe and no chemicals to inhale. I don’t have stainless, so would love to hear from someone who gives it a try! Actually, I forgot to mention that I do this in between my cleans. It is a great fast clean up. I feel it doesn’t quite get all the prints off, but it keeps it looking fresh between big cleaning days. I am a huge fan of vinegar water. I use it for most everything! Windows, mirrors, counters, floors. I just love it. I professionally cleaned for 13 years. I cleaned windows, Crome, mirrors and stainless steel with Vinegar and rubbing alcohol. Ratio of 1 part alcohol to 2 parts vinegar. The vinegar cleaned and the alcohol dried it quickly so no streaks. On large stainless I cleaned it in sections, and dried it with a dry cloth before moving to another area. Just went to the store to get the dust and allergen pledge and found they actually have a Special Surface Pledge just for stainless steel and other hard surfaces. Oh, I haven’t seen that. Tell me (and all of us ;-)) how it works! Going to try it out tomorrow. Will let you know! My family owns an appliance store, and Pldge is what our manufacturers recommend! Personally, I just use extremely hot water and two microfiber towels – one wet to scrub those spots, and one dry to buff them to a streak-free shine. I have had stainless appliances for years and think I have tried most products. The stainless cleaners leave streaks, the olive oil method that they show on HGTV looks nice at first but creates an incredible build-up that takes a while to remove. I have wood floors in my kitchen, so I also have to watch for overspray. I recently went through months of house showings for an aborted move and finally determined that Windex was the best option. You just have to be very FAST. The trick is to spray a portion and wipe it quickly with paper towels. You’ll immediately see streaks, but they will dry. I still say stainless appliances are the WORST to clean (ditto for the dark hardwood floors that I thought were so beautiful). Next time I’m doing black appliances and wood-look tile floors. Oh, my friend is doing the wood-look tile. It seems amazing so far. I feel like I dodged a bullet, when we opted against the dark wood floors. I pouted at first, since it was not by choice that we opted out, but by budget. But now I am really glad, when I see the trouble others have with keeping it clean. Good luck! I use Windex to clean my stainless fridge as well, and it works great! I also use it to clean my stove top and my sink faucets. It cuts through grease very well on my stove top and makes it shine! I learned this trick from a person who owns a laundramat. Good old fashion baby oil does the trick. and a little goes a very long way. anykind that you can get your hands on . the cheaper the better. Put a little on a paper towel and rub along the grain. there will be a slight film of oil.. go over it with a dry paper towel in the same direction. all finger prints, and streaks disappear and you won’t have to do it as often because the oil repels the prints. Also for stainless sinks , after cleaning rub it with a little olive il. No more water spots. another vote for the oil method. Thanks Cynthia! I too use Weiman and it does a great job as well. I will try the pledge and see how that works. As for the overspray I usually just put napkins down on the floor and I use those same napkins (sprayed on side) to wipe down the fridge. I’ve never really used a microfiber towel, and the napkins don’t harm the stainless steel. I never thought of a napkin or paper towel. Duh! Thanks for that! I use the Weiman wipes. I can use one wipe for all my stainless and go back over with a microfiber cloth to shine. They work great. They sell them at Target. WD40 or any other spray lubricant works as well. It actually got a spot off of mine that nothing else had touched. It makes the cabinets look nice and shiny too so if you overspray no biggie. another great tip! Thanks Marti. Orange glo works great also. Just spray it on a rag and wipe down. There is no overspray. When I’m lazy I even use a paper towel an then throw it away! Surffed on from Pinterest! The Weiman in the trigger spray bottle is the only thing I’ve found that works on my stainless steel stuff. It gets overspray on my tile floor, though. When my appliances need a really good cleaning, I do it right before I mop. In between, it works pretty well if you spray the stuff on your cloth instead of on the actual appliance…no overspray. If you ever see the Weiman Stanless Steel wipes, don’t waste your money! I tried those once. They don’t have enough solution in them and they don’t work. Stick to the spray! Weimann is the best I’ve used (I clean houses). But it doesn’t get rid of water spots and such. I’m going to try the Pledge trick on those and see if I can make them disappear and then continue using Weimann! Thanks for the tip! Hey Beth, you said you clean houses. Can I ask how that works for you? A few people have asked me to help them clean/organize their house but i dont know how much to ask for, etc. I think it might be a good help to supplement our income and I love cleaning/organizing. Where i live $20/hr is the norm. Some charge $15 & some charge $25. Depends on experience. For move-outs $30/hr. This is if you are self-employed & not work for a company. It also depends if you use their cleaning products or if you buy your own. Hope this helps. The oil approach works for the moment… but the oily residue attracts dog hair. So before too long, my clean fridge has very visible dog hair stuck on it! If you have the time and strength, use Bon Ami. I take a tiny bit of Bon Ami and a clean wet sponge to the entire surface. Then I go back and splash water on the surface to rinse. I dry with a clean towel. It is the perfect cleaning solution. Beautiful, flawless, clean finish, but the process is a lot of manual labor! I’ve been using Windex ever since Martha Stewart said on her show that’s what she uses. Actual Windex works best and not the store brand “glass cleaners”. Thanks for the tip- found this through a pin:) I am excited to try it as I just got new appliances and the fingerprints from my 1 and 2 year old are driving me crazy! I think I will stick with a microfiber cloth because the appliance people told me to never use a paper towel as it could damage the surface and always wipe in the same direction as the “grain” of the stainless…if that makes sense…but I am new to these appliances and am so paranoid I will ruin them trying to get them clean, looks like a lot of people have found many things that work safely…thanks for all the ideas! My kids are 6 and 8 and the grime they get on their is amazing. So I feel your pain! I only use microfiber as well. The paper towels make me nervous too! But I know people have used them successfully. Good luck! Any suggestions on what to do about a pretty deep scratch on a stainless fridge? We had people over and someone’s buttons on their pants scratched it all the way across. :( Thanks!! Oh no!!!! I don’t have a tip for that. Hopefully one of the readers will. I would love to know, just in case. I am going to repost your question on the facebook page and see if someone there can answer. WD 40 and very fine grit sand paper. Go with the grain! Pledge has wax in it and can build up over time. I would recommend Endust…it has no wax and a small amount of oil. It makes I look beautiful! Another great tip. Thanks Kathleen! I would love some tips on removing scratches from stainless. Me too! Anyone? Anyone? I may have to research this one. Thanks Leah! http ://www.ehow. com/how_6106253_remove-scratches-brushed-stainless-steel.html These are instructions just for brushed stainless. Just bought my first stainless steel kitchen and I am already regretting it…but thanks for the tips! You are welcome! I regretted it, until I figured out how to clean it. I detest my stainless steel kitchen appliances, as well. Have had them 9 miserable cleaning years and as they wear out & have to be replaced, it will NOT be with stainless. My favorite was to clean my stainless steel appliances is with good old fashion windex and a GOOD microfiber cloth (I use Norwex microfiber cloths and it’s worth the money for a good quality microfiber cloth that won’t leave lint or streaks!) The windex overspray is so easy to clean up! Just spray windex and wipe. Another vote for Windex. Thanks Monica! I have tried every cleaner under the sun and never got very good results. One day I was cleaning my counter with Clorox disinfecting wipes (you can get a four pack from Costco -different flavors) and thought what the heck, and wiped down my Sub Zero stainless fridge. Wow was I surprised! It cleaned it with no effort. I just noticed on the containers “stainless steel”! I use it on the appliances, cupboards, everything! So easy! Try it! I have the identical refrigerator, and it is impossible to clean. I’m not happy at all with the quality of the stainless steel. My other appliances don’t give me nearly as much grief! Looking forward to trying your techniques! Thanks Jennifer. Yeah, my Dishwasher is even worse, if you can imagine. Do these all work on brushed stainless steel too? My shiny stainless steel works, but my fridge is brushed. Any suggestions??? I don’t know. I don’t have a brushed appliance. My toaster is brushed and I clean it with windex or vinegar water and that seems to work ok. Any suggestions readers? I’m not sure if it works, however, what about using the pledge multi surface? I don’t think it has any wax in it. I am hearing a lot of good things about the multi surface. Definitely going to give it a try. I just tried this on my brushed stainless dishwasher, and it has never looked worse. So I guess the answer is, only use this trick on shiny stainless! Heading for the Windex. Oh no! Thanks for the heads up. Sorry you had to be the guinea pig. I will put a warning on the post. Thanks to everyone for the tips and comments about cleaning stainless appliances! I’ve learned so much from reading them all. I can’t wait to see some advice about scratches (mostly in my sink). Oh, I would like that too. And how to remove aluminum marks from white porcelain sinks. Thanks Shari! From a housekeeper, the best think I have ever found for marks on white porcelain sinks… Magic Eraser, and don’t do generic. Get Mr. Clean. Really, marks be gone. If they aren’t Bon Ami. To clean brushed stainless, I make a paste of cream of tarter and water. Wipe it going with the grain with a sponge then wipe off with a wet microfiber or soft cloth. I have two small kids and don’t like to use chemical stuff to clean what they will be touching. Thanks for the tip, I love the Orange smell, so that is really good to know! Magic Eraser works great on brushed steel. On shiny steel I might use it, but lightly. It IS abrasive and if you go at it hard it might just leave some ultra fine scratches that look like a cloudy area on the finish. This I have never used, but it kind of makes sense. Jeweler’s Rouge is used by jewelers to remove scratches from jewelry. Here is one link that explains it somewhat, BUT, I would look on amazon, and use the shopping utility on search engines, for the best price. Additionally, if I needed this I would search for sites on how to use it as well. I use invisible glass cleaner. It’s foamy and works well! I would love to hear comments or suggestions on the brushed stainless, I bought brushed after having some experience with regular stainless in food service. I had given up on getting my appliances looking good again. I tried lots of tips I found on the internet, but nothing worked–until now. Thanks for sharing! This absolutely works on brushed steel I discovered it long ago. My frige came with a little bottle of creamy liquid that smell just like pledge so I tried my pledge and voila! c’est magnific! I have 5 kids an all brushed stainless appliances. I have found WD-40 works the absolute best. Even have the housekeepers using it–and now they swear by it! Little bit goes a long way…. Thanks for the tip Amy! I use 409 to clean and Weimans to polish. I hate the greasy look from stainless cleaner alone. 409 cuts the greasy buildup, removes stains and marks. Just a light spray of Weimans and buff it with an old cloth diaper. Perfect! I like the combo idea. Thanks Shannon! I work for appliance merchandisers and the appliance showrooms I work with use Steel Meister and a microfiber cloth. I spray it on the cloth and then wipe (no overspray) and when I’m done I just put the rag in a ziplock for next time. It easily gets rid of finger prints and steaks and helps keep it from getting new fingerprints. I use it at home and I have a 1 year old and a 5 year old. Everyone always comments on how good my fridge, stove, and washer look. I like the sound of that, thanks Kale! How long does it stay nice and shinny clean??? I’ve tried it and it doesn’t work to make me happy. A friend sent me a cloth that is fantastic and I swear by it. You have to get all the junk off that has been put on and then all you use is warm water and this cloth. Fantastic, and I am not having to clean it every week or every other week for all that goes. I now LOVE my stainless steel appiances. It lasts until my kids attack it again! :-) What is this magic clothe? I would love to know! Love my Einshine! It’s kid and pet safe and has no harsh chemicals like Weimann. I used to use that stuff and I’ve noticed as soon as you clean and polish, the fingerprints come back rather easily. With Einshine you have to polish and put a little more wiping effort than Weimann but it keeps the shine longer. Bonus: Einshine has a wonderful scent to it that doesn’t give me a headache or sting my eyes like Weimann did. Good Tip PC, I am driving by Crate and Barrel today. I will try to stop by. Thanks! Thanks Susan! So just straight orange oil? Any certain brand? I use scrubbing bubbles with a micro fiber cloth. Works awesome and no buffing needed. I do let it sit until the bubbles have dispersed and then just wipe. Great Post!!! Can’t wait to do this! We bought our home 38 years ago, and the kitchen had stainless double ovens, stainless double sink, stainless dishwasher and also the refrig was stainless. After trying to clean it for years, I hated it……truly, I did. When I remodeled my kitchen, I went with all white appliances, and my life is so much easier now. However, I just discovered that if you mix hydrogen perioxide and baking soda (half and half of each) it will clean anything. I think it will even take off your circle smudges on your refrig door. I have been using this for all of my cleaning chores and it is a miracle cleaner. After struggling and trying every stainless cleaner imaginable, only to throw most of them out, I finally found the answer from a friend when I was seriously regretting ever having purchased stainless appliances. I normally would NEVER have purchased these because they were being sold at our state fair but this time I listened and bought them. They are white cloths that you just use with plain tap water. Get them wet and ring them out and wipe away. You don’t even have to dry the surface. It dries spot free. When dirty you just launder them. I use them on my plain and brushed stainless, which are now as easy to clean as the old white appliances. Previously, I couldn’t find any way to clean my brushed stainless refrigerator. They saved my life and possibly my marriage. LOL They’re called Ultimate Streak Free Cloths. You can find them at http://www.ultimatestreakfree.com/. Know that I have nothing to do with this company and am just trying to save you the heartache I went through. I’ve been reading all the recommendations but pleas know that if you use Pledge, WD40 or anything else with oil, it will eventually build up and leave you with a complete mess. I also think that success with various products depends on the type of stainless steel finish, so it would be prudent when you post your recommendation to also mention the brand you are cleaning. I hated my stainless steel appliances (cleaned with Pledge for years) and the build-up of product just made things look BAD. I read about BAR KEEPERS FRIEND (on Pinterest) tried it out, and it made my stainless steel appliances look AMAZING. After that one time clean up I now just clean them with water and dry immediately. I’m sure I will clean with the BKF again monthly but for now the wet/dry cloth is working fine. It was the build-up from the other Pledge/oil products that messed up my appliances so bad. I also read BKF removes hard water spots from glass shower doors so I’m trying this out today as I’ve tried every other product under the sun and nothing has worked! I highly recommend Spray-a-way Stainless Steel Cleaner. I’ve tried everything out there, including homemade formulas and olive oil. The Spray-a-Way is the best. Spray on, wipe with paper towel and shine with microfiber cloth! We use Brasso and apply and polish with a hand sander that we put a micro fiber cloth on. Makes the job fast and easy. Lemon oil works great for stainless steel. Hands down, weiman products are the best. I have tried almost everything…the stainless steel products are unreal. 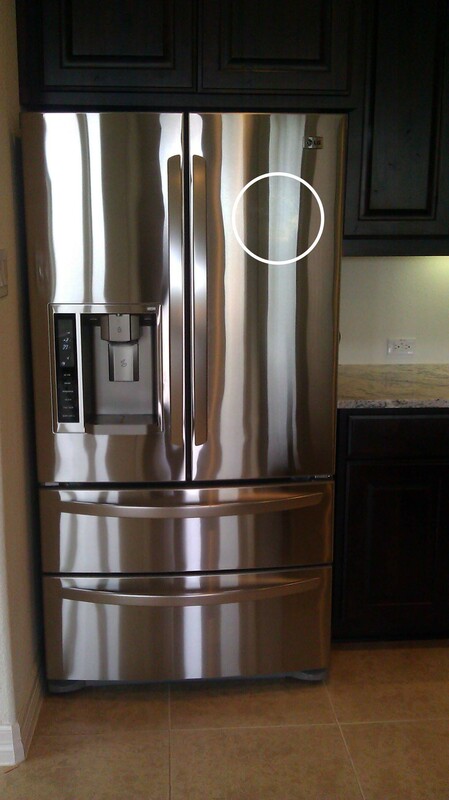 It’s like magic….I use the stainless steel wipes on my fridge and it leaves no marks, nothing! I can’t wait to use and try more of their products…you can tell the difference between quality products and cheap products after using weiman products..trust me! I like weiman too & just found wipes for stainless steel at Wal-Mart. They work great & no chance of overspray!! Been using WD40 for my stainless steel appliances. Love it. Thank you, thank you, thank you!!!!! I have been racking my brain trying to figure out how to get it completely clean! I love youuuuuu! We recently overhauled our house, everything new except the kitchen cabinets. The new windows were full of a layer of dust from the walls being mudded and sanded. Was so overwhelmed with the clean up that I eventually wound up on FlyLady.net. Everyone boasted about the purple rags. I already had tons of microfiber rags but I bought hers. They are the ultimate. I just wet one and wring it out and do my windows, mirrors etc., no streaks no matter which way you wipe. No more paper towels. My windows always look great and I have four dogs. Patio door always clean. Really think you’d love them like I do. Wipe my appliances, brushed and non brushed, look new. What is the name of these purple rags? I will most definitely purchase some. And where did you purchase yours? One other wonderful place to use pledge….Glass! I used to work at pottery barn and Williams Sonoma. We used pledge all the time to keep stemware and drink ware and the glass shelves looking perfect! Also keeps dust from sticking. Perfect for your china hutch and glass chandeliers at home. Gotta try that! Thanks for the tip! Update on Stonemeister. Applied two weeks ago and have not reapplied. Wiped off a few minor drips from the water dispenser and goop from someones hand using a paper towel. Shine still there. No smudges, streaks or fingerprints. After trying most of the other products mentioned above, I will have to say that this is the best. I have been using WD-40 on my grill but Stonemeister is going on it next. I have always used Wieman Stainless Steel cleaner, but I always spray it on a cloth first and THEN polish my stove, fridge, microwave. I use the same cloth each time and just keep reusing it and spraying more cleaner as I need it. Sometimes I just grab the cloth and don’t need additional spray on it. No overspray when you spray it on a cloth. I love the results using Weiman’s with micro cloth then after I’ve cleaned it ( always with the grain of the steel), I use a car polish micro pad and buff it in small circles. It is a PITA, but, looks good and stays fairly clean ( as long as I dry my hands before using handles or spazzing with the water dispenser). I buff with the polish pad for touch ups in between my weekly polish. I have tried everything. Thanks for all the comments. I used something on the new fridge a few mos ago and I thought it was ruined! I had cleaning streaks all the way down. The ONLY thing that got it off was the liquid bar keepers friend using a microfiber sponge. I tried everything that everyone suggested first. I now love that cleaner, it even took off the discoloration from the 1 magnet I was able to get on around the icemaker. My fridge looks brand new again (and it’s only 6 mos old). And I can put the magnet back on since it was our organizer. Now what am I to do with all these cleaners I bought that don’t work, at least up to 6 now. The pledge was aweful on my LG, not sure if it’s just the brand or what. The Weiman’s didn’t do squat either. Next is try it on the grill like someone suggested. I wonder if it will get the dog pee off from visiting bog pups? My polish speaking cleaning lady tried her hardest to speak “yellow cap”…we finally figured out she wanted Pledge for the stainless! Works great but when she over-sprays we all take a spill or two when walking on the wood floor. I to have tried every stainless steel cleaner on the planet. Most left a buildup, or streaks. My solution Spray 9 found usually in the automotive section of most big box stores. Results are sparkling stainless (Shiny or Brushed) no fingerprints,no streaks, no buildup. Simply spray wipe and rinse,let air dry. No slippery mess left on the hardwood floor. By far the best solution I have found to clean my stainless appliances. Awesome results. If you spray stainless steel cleaner on the glass part of your microwave it takes off all the oils and residue, that was found out after I used everything in my house trying to get oil off mine!! Your pin caught my eye when I realized I have the exact same frig you do. I was told by the appliance guy to use any type of oil to clean it, with lots of buffing with a dry cloth, since you are essentially filling in the grain. However, I find an oil product to enhance future fingerprints. I have used a Bissell Stainless Cleaner for a year now and find it works the best over all my appliances, frig, stove, dishwasher and even toaster. But I tried almost all of the hints above on my toaster to test them out. Am concerned that Plege may do a good job initially but will build up over time, just like it does on furniture. Still found the Bissell brand to do the best job on everything, I have not tried the Weiman brand yet however. Plan to buy some and see how it does. Me again….oh and I used the Bartenders Best Friend on my stainless sink. Works great. Use a microfiber cloth and your favorite cheap vodka or gin. Takes all the fingerprints right off! No streaking. Stainless…a misnomer. I worked for a railroad that serviced US Steel’s stainless facility. One day during conversation the terminology came up. One of the guys said it is not Stainfree Steel…it stains less than regular steel. Thus the derivation. BTW, I think it was Boeing or another aircraft corporation that invented WD-40…it was the 40th attempt at making a product for aircraft engines. At any rate it owes its unique smell due to a fish oil.Also, my favorite cleaning agent is 93% isopropyl Alcohol…just be careful what you use it on. It can dissolve some plastics and remove clear finishes. Oddly, I am able to use it multiple times a day to clean my high end multicoated eyeglasses without harm. I had an appliance repair man at the house. He recommended the pledge appliance wipes. After many other attempts at other products or suggestion this has been my new method. They work well. Although they so not take the hard water stain off under the ice/water dispenser. I will try the wd40. Great reading all the suggestions. I may by the weiman wipes as well and compare. Thanks ladies. A healthier more natural way to clean and polish your stainless is with a microfiber cloth and vinegar, that’s it. Nothing else needed. No breathing in caustic fumes or worrying about overspray on anything. I’ve used pledge and stainless cleaner for a long time. They both worked for a while but then the buildup started and my fridge looked spotty no matter how much I wiped and sprayed. A friend told me to clean it with soft scrub and warm water to remove the build up. I did just that a few times, the build up is gone and all I do now is wipe it down with warm water and dish soap. My fridge is a samsung, it may be different for other brands. Windex works perfectly on my brushed stainless appliances usually. And vinegar. I too have stainless steel appliances. And boy do they collect fingerprints. I use Windex to get off any major smudges on the SS and granite. Then polish the SS with Weiman wipes. Then wipe over that with old dried up baby wipes or I use the floor duster wipes. They are soft and work really well as polishers. I have tiles throughout the house, and since they look more like stone you can’t see any dirt. But they are hard on the feet. Original Endust (red spray top) is what we have used for 30+ years ! I use a magic eraser first and it gets off everything. Then I polish it with pledge or stainless steel cleaner. I hadn’t thought of using pledge!! Brilliant. I clean for a living and use various stainless steel polishes based on what works best on the multiple finishes. Pingback: 37 Deep Cleaning Tips! Has anyone ever tough of this? I use weiman spray, don’t like the wipes, because they dry to fast for me and just use like half o them, used to overspray all the time, until when I am halfway instead of pointing the nuzzle down I’ll point it up!! No more over spray!! Just be careful to aim your fridge and not your face. And he told me baby oil after I mentioned hating all the cleaning products I have tried! Everyone can’t believe how amazingly bright all my stainless appliances are… I use them on the fronts of the Viking stove top and hood, the ovens and microwave and my LG fridge that blends in just fine! Seriously – baby oil and a microfiber cloth has been my salvation! ok, so I have tried pretty much everything from pledge to 3 different brands of stainless cleaners and all of them worked for a while…..until the buildup was just too much. A friend of mine told me to wash my fridge with a sponge and soft scrub. I did, made sure I rinsed it a few times to get all of the soap off and then towel dried with a microfiber rag to avoid fuzzies. I actually had to do the soft scrub method about 3 times since I had a lot of build up on my fridge. 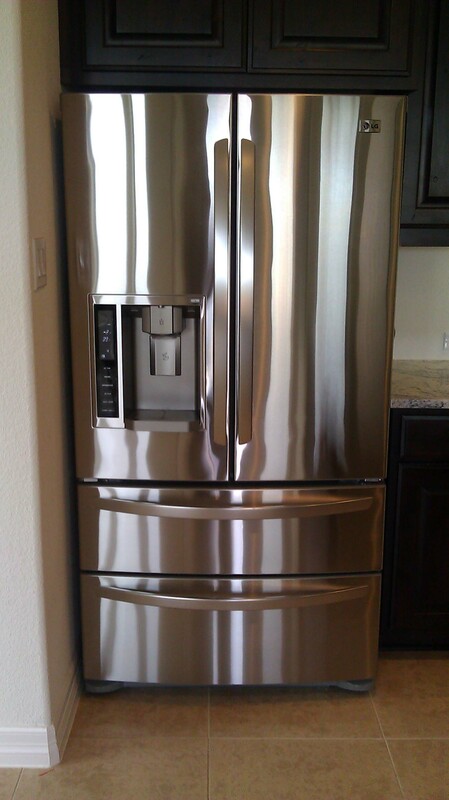 All I ever do now, is wipe it down with dish soap, rinse and voila…..shiny fridge. Mine is a Samsung and I know that different brands take differently to certain cleaners. I do have an Electrolux stove and the pledge has never worked on that. Hope this little insight is helpful. I own a Bosch dishwasher. The front panel had drip stains that I couldn’t remove. Because it was still under warranty, they replaced it. The 2nd panel had similar problems. The instructions on their “cleaning packet” were to wash with soap and water to clean, then apply oil with the cleaning cloth. When I spoke with CS at Bosch, they told me to use MINERAL OIL. So now I wash the SS with a little dish detergent, dry it, and apply mineral oil with a paper towel. I then go over it with a dry paper towel to remove the excess. It looks like new! I agree about the Flylady.net products. The “rags” are amazing–as are all her products. Most work exceptionally well with water and/or vinegar! Good luck. I have tried all of these things and find that the thing that works best for me is my hand-held steam cleaner. I hated my SS when I first got it. I was using Weimans and it just seemed to attract prints. It built up and was hard to wipe dry without streaks. I went over the whole fridge with baking soda on a damp cloth to get off everything that had built up. Then I started spraying a rag with Windex and using that. That was an improvement but the first time I used the steamer, I was amazed. It’s just water and does not hurt anything. I just spray and then wipe dry. No oils to smear. My fridge stays cleaner longer, until my great-grandsons come over. Then I get out the steamer and do it again. My fridge is a GE. My dishwasher is a Kitchenaid. Whenever I get a water spot that runs down, I use the baking soda or Bar Keepers Friend. Rub lightly with the grain, rinse and dry. I have special cloths I buy from Autozone that are for windshields. My grandsons just put a ding in my fridge. I looked on Ebay and found some vinyl stickers of dragon flies and flowers. I think I am going to buy some to cover up the ding. I have white cabinets so white vinyl stickers should match well. Scrubbing Bubbles bathroom cleaner FOAM is perfect for stainless steel as well. For a Stainless Steel sink, my housekeeper told me to use a Mr Clean magic sponge with a dot of blue Dawn dish washing soap to clean a stainless sink and wipe dry….looks brand new and easy! As a house cleaner my advice is weiman splay, it is hard to find, i live in Georgia and most the time i find at Publix, and a friend house cleaner as well told me that a wet microfiber towel with comet works good too, never tried this one. Orange Glow works really good too. I use that a lot. Did you know that you’re supposed to spray your rag, and not what you’re cleaning? This is especially true with glass cleaners when cleaning artwork under glass or mirrors. The moisture of the cleaning product drips into the frames, and will eventually distort the mirrors (think of the foggy old mirrors you see) and will cause mold under frame on your artwork. By spraying your rag, you avoid over spray on floor and cabinets! ok,fridges and stoves are different than elevator stainless.anyone find an easy way for elevators? l have tried everything including baby oil which is good because you can touch up with dru cloth for finger prints,but there must be something easier? A lady that did our floor cleaning at my work building was cleaning our elevators one day and they looked beautiful. I asked what she used and she told me WD-40. To use that on all stainless steel items. I started to use this on ALL my kitchen appliances, which are brushed stainless steel and it works wonderfully. I spray WD40 on a lint free cloth and then rub on to the appliances following grain. It always leaves them looking brand new. When I got all my appliances for Xmas 3 yrs ago, the first thing I wanted to know was how was I suppose to keep them looking so good. I don’t ever use paper towels nor just water. I’m happy with this. WD40 goes a long way still have the same can. Just wanted to share this method. I work in a nursing home and have found that the best way to get the elevator clean is to use glass cleaner first and then use pledge. Looks great and smells good too. I tried a lot of different things and I’m excited that I found something that finally works. The stainless steel cleaners didn’t work good at all.